The Ford Taurus X dates back to 2005 when it entered the market as the Freestyle. The tall wagon-like body offers a unique combination of SUV-like styling and three rows of seating without the excessive height and body roll of a SUV. 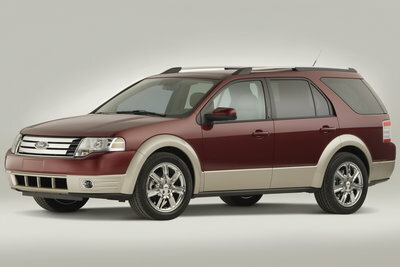 For 2008, Ford renamed the Freestyle the Taurus X marketing the vehicle as a wagon alternative to its sibling, the Taurus sedan. Despite the confusing history, the Taurus X offers buyers a unique way to haul six or seven passengers without opting for a larger vehicle. Although the Taurus X sits about 6 inches shorter, it provides headroom and legroom in all three rows that is similar to the much larger GM crossovers. A new 3.5L V6 and six-speed automatic are standard on both front-wheel-drive and all-wheel-drive models. The only drawback is the somewhat lower fuel economy ratings of 16/24 (FWD) and 15/22 (AWD).